Obesity and overweight are risk factors linked to the appearance of a number of chronic diseases such as diabetes and cardiovascular disease. However, obesity also has an economic impact. Indeed, studies that have quantified the economic burden of obesity in Canada and abroad observe that the problem engenders significant costs for society. Such costs are not confined to those stemming from broader recourse to health services. Costs related to absenteeism, disability and other productivity losses that obesity engenders are at least as high as costs related to health care. Accordingly, studies of the economic burden reveal that the rise in overweight and obesity is not a source of concern solely for interveners working in the health field. Indeed, health problems linked to obesity affect several sectors of the economy and the resulting economic burden. Investing in the prevention of obesity thus offers benefits not only for the health of the population but also for Québec's economic vitality. 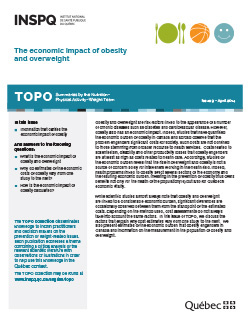 While scientific studies almost always note that obesity and overweight are linked to a considerable economic burden, significant differences are occasionally observed between them from the standpoint of the estimated costs. Depending on the method used, cost assessments do not always take into account the same factors. In this issue of TOPO, we discuss the factors that explain why cost estimates vary from one study to the next. We also present estimates of the economic burden that obesity engenders in Canada and information on the measurement in the population of obesity and overweight.